Standing as she was, the Halasian blocked the hallway well enough that she felt no need to initiate anything physical against the woman. For now, she was curious as to her intent. If the woman tried to get past her, well, that would certainly be a time for action now wouldn't it? As she watched, the woman lifted something to her lips and kissed it. Sivenka's eyes narrowed on the symbol of the Tribunal, and her brain immediately started churning through more possibilities. She'd been intrigued initially by the fact that the woman had chosen a non-lethal method of disrupting the workday. Now? Now the woman was showing herself to at least nominally follow the same deities, which was something she certainly had not expected. Listening to the woman speak, she kept her face set into the stern anger that had set in when she realized they were being invaded by a thief. But internally, her thoughts were in turmoil. This was certainly not something she had expected. Well, she'd never expected being robbed in the first place - the guy just had a bunch of pretty junk. But she also would have expected that any improbable robbery would also involve much more violence. Would that the woman had merely burst in. Violence she could handle. Violence she understood, and it would give her more of a chance to unload her temper onto something that was much more satisfyingly squishy than the marble pillar. But, dammit all, everything the interloper said made sense and seemed quite logical. Only when the woman fell into silence, and gave that little glance over her shoulder that betrayed all of her fear, did Sivenka speak. Her voice rumbled from her chest as though emerging from hibernation. "What is it you seek, and why, fellow sister of the Hammers?" She moved then, lifting her hammer as she did and settling it into place on her back as she strode past the woman to look down at her young companion on the floor. His eyelids twitched in indication he'd wake shortly. She considered him for the moment, then "gently" tapped him with her heel on the jaw. The twitching stopped, though he kept breathing in his unconscious state. Lifting her eyes to the woman again, she continued. "You have about five more minutes to explain yourself and leave. I only give you this out of the most remote sense of kinship. Use it wisely." Five minutes. Well it was something. Though she mentally had hoped the woman would agree to just let her by with enough compensation, she had known that chance was nearly non-existent. She struggled for about ten seconds to find her words, straightening herself out and once again looking to the door that the artifact was hidden behind. "Your Lord has no idea what he has. It's almost worthless but it holds the possibility of answers to me. The answer to everything that I hold dear." She leveled her gaze on the woman. "I don't expect you to believe me, even if we place our faith and lives in the hands of the same gods." She bowed her head, exhaling a deep, and resigned sigh as she plucked at a stray thread on her robe nervously. The words were not coming easily and no matter how much her father instilled it in her, being duplicitous took a lot of effort. She could hear his deep, baritone voice ringing in her ears. "You can lie as much as you need, as long as your intentions are good. But never, ever dare lie to your family or those you care about." Finally she decided that she might as well confess, knowing it couldn't hurt her chances more than any of the lies that bumbled through her head would and despite his training, her poker face was dubious at best in situations like this. She turned her eyes up to the halasian woman, giving her the raw truth. "I can't leave here without knowing I have exhausted every possible lead behind the death of my family and the organization they belonged to..."
"And the only real lead I have is in that room in a display case. I just want answers. If I don't get them tonight, I will keep coming until I have them." Her voice held a sharp edge now as her fingers rapped against the pommel of her hammer. No part of her desired to meet this woman in combat, but she wasn't about to give up now. Sivenka listened, completely impassive outwardly as the red-headed woman spun her tale of woe. As the woman spoke, she returned to her position of blocking the woman, massive arms crossed over her chest. Each time the woman fidgeted, it seemed to strengthen her own resolve to stay as still as the statue she'd mimicked when the hallway had been invaded by this strange koada'dal. For the most part, she listened not to the words but to the expression behind them. The nervous shifts, the emotions crawling across Verethne's features as though being painted on there by an artist as she spoke. Every bit of unspoken speech that was heard led her more toward believing the strange excuse the woman gave. The final gesture of the fingers rapping against her hammer brought a smirk to Sivenka's face. It nailed home for her the notion that the woman truly was desperate, as well as apparently honest. She didn't carry herself like a fighter, despite the hammer at her hip, and for her to even suggest going up against Sivenka made the story she'd just woven seem quite true to the Halasian. Sivenka remained silent and impassive mostly for show, letting the woman sweat. The 'dal did, after all, just break into someone's estate. Finally she spoke, shaking her head a little. "So my, according to you, small-cocked Lordship has an artifact in his display that you need. It somehow holds the key to the deaths of your family and some mysterious organization. The only key, I might add. And because of that, you will continue to interrupt my peaceful evenings until you manage to break through our protection and get the object." She sounded a bit disbelieving, giving the 'dal a pointed look before continuing. "Tell me when your family died?" Her voice softened slightly at that, hinting outwardly at her willingness to go along with the story. It was that single fact that had truly swayed her; coming from such a large clan she couldn't fathom losing all of them without answers. The question caught her off guard. She had not expected the woman to care, much less ask for details. Five minutes was not a long time and the notion of running still nagged at her brain. She was certain that if she chose to leave that the woman would see to it that the security was heightened for the coming days, making her task that much more difficult. The koada'dal drew a shallow breath, closing her eyes for a few seconds as she weighed whether or not this was a delaying tactic by the woman or if this was something she was even willing to share. This was the first time she spoke of it to another person who did not already know. It was far easier to accept the expected sympathies of the other noble households than it was to speak of it to a stranger. "A few weeks." Her pained reply came hesitantly and she straightened her spine after she said it, tightening her resolve as her blue eyes settled on the door to the artifact room again. It was within her reach and so very far away at the same time but she forced herself to consider her words again, knowing that was a very brief answer that was unlikely to satisfy the guards woman. "I came to and they were..." She shook her head, dismissing the memory as quickly as she could. Though the vision of their bodies still burned in her mind's eye and she had to take a deep breath to force it away before continuing. "It's not something you can ever hope to forget." Once more she looked from the wooden door to the room and the hallway she came into, considering her options while the halasian mulled over her own. The pain of the woman's response touched Sivenka, and a cloud of emotion left the shadow of a frown on her full lips. "I can't imagine losing my own clan. 'Tis huge, they're everywhere, really." She gave a half smile at that, and looked over her shoulder at the collection. To be truthful, the boy on the ground had a good ten minutes in him; she'd named the five to keep the woman on her toes. With that in mind, the Halasian continued to consider her options, her bright blue eyes flicking between the koada'dal, and the collection that she'd always considered to simply be pretty junk. After having been at sea, this guard work was getting a bit mundane. She held no true bond to Lord Karivial, none that would cause her any grief to sever. She was an invisible cog in his well-oiled machine; and with having a full foot of height on the short and greedy man, he'd never even made a pass at her. Not like the servant women in the other parts of the estate. No, she was merely Guard Captain Sivenka - an honor at her age, but she was well aware it was due to necessity rather than respect. It was her personal sense of honor at stake here, and her own inner thoughts on justice. Experience with Lord Karivial told her that there was no way this woman could approach him and request to view or even purchase his collection. The knowledge that someone else was interested would make him quadruple his asking price and shut down all attempts to visit. So what mattered more to her? This young, tormented woman getting closure and perhaps vengeance for the death of an entire clan? Or her standing in the household of an odious man who let greed guide him more than any internal compass of morality or ethics? The koada'dal woman fidgeted again, looking to where Hetley still lay collapsed in a heap. At this latest glance Sivenka finally spoke up again. "Show me which item it is. You will not steal it, but I wish to see it with my own eyes." It was, of course, a final test, to see if this woman truly had a singular object in mind. The woman's proposition had merit and it was more than she could have hoped for. Although she certainly felt uneasy still, as she was not sure what the artifact would reveal when she found it and that was a danger all on its own. She knew it was not a wise practice to mess with an object of unknown power, nor was she even sure she could activate it if she had it in her possession without weeks of research. Her clues were inconclusive at best, but she had one shot to get in the room with it and even if she couldn't leave with it she would commit every detail to memory if she had to. Or find a way to incapacitate the woman while they were in there. Though her conscience and heart did not like that option very much. She wasted no more than a few precious seconds thinking about it and walked toward the woman, her hand still on the pommel of her hammer just in case. After all, her honesty would mean nothing if the woman she spoke to was being dishonest and luring her in for a knock-out punch at close range. As she neared Sivenka, her eyes hurried to the woman's great hammer momentarily before deciding to chance it and come close. Pushing away her nerves, she spoke with more confidence. "I have a basic description. If you could help me locate it, this will be faster It should have this mark on it." She fumbled in her pocket for the rough sketch of the Starpyre mark and held it out to the towering guardswoman. "That is assuming..you've been beyond the door before?" Sivenka could feel the red-head's trepidation, could actually almost smell it on the air as the woman approached. Knowing how the woman felt, she kept her arms crossed over her chest. Her hammer remained where it was, her eyes simply flicking to the woman's face. As Verethne stood before her, Sivenka gave her a slow nod of approval. It took balls, figuratively, to approach her. She had to give credit where it was due. Only after that did she take the sketch and study it for long moments. Without looking up, she spoke. "I've been beyond the door. I'm well acquainted with his entire collection." It was not a matter of boasting, and simply stated plainly as she continued to study the sketch. Finally she looked up and handed the sketch back. "I've seen something with this. Come." She would turn and not even wait to see if the koada'dal followed, moving toward the door and swinging it open. The collection took up a large room with two floors and a large open atrium in the center. Within the center of the atrium grew a small garden with bushes and lush trees. It was far more lush and full of life than should be found in an indoor garden, but Sivenka didn't give it a second glance as she started to simply walk past it. The lack of a hammer crushing some part of her body put her at ease, if only slightly. There was still a lot of unknown beyond the door and the artifact itself. Still, she followed and mentally prayed to whatever gods might listen that what they found held answers but also was enough to keep this woman from changing her mind and bashing her skull in. She doubted the gods would have anything to do with such a plea but she still replayed it in her head as they walked through the collection of artifacts. Some she could swear she had seen illustrations for but none that came to mind with any level of importance that she knew about. The garden drew her attention for a few seconds, because it was pretty and unusual. Still a fleeting memory of the deep corners of Faydark came to mind as they passed it. "Thank you." She whispered, even if they didn't need to be doing so. "For at least considering this." It seemed like the thing to say as they moved through the collection, even if the woman was not likely to let her leave with the artifact she had to acknowledge that she put herself on the line even allowing her to see beyond the door. 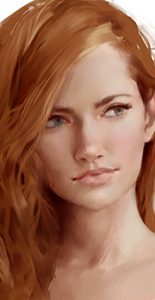 Sivenka paused, glancing at the redhead with a neutral expression. Finally she nodded, and continued toward what appeared to be a collection of ancient tomes. They were arranged as though showing off the fanciest of the collection; heavy books with gold bindings and jeweled trim. "It goes without saying, that if you try anything, I will end you." She said it in a conversational tone, like she was asking for an ale down at the tavern. Ignoring the fancier books, Sivenka reached to a back shelf. Books there were arranged by color of all things, rather than any sort of useful method like title or even subject. Just as her hand hovered over a lilac colored tome with a variation on the symbol Verethne had sketched adorning the binding, it started to move. Slowly at first, it shook on the shelf as though waking from a long torpor. Growling, Sivenka shot Verethne a look of extreme betrayal. "Trickery!" She snapped, and grabbed the book just as it launched itself off the shelf toward the koada'dal. Her free hand was swinging around to the greathammer strapped to her broad back. For all that motion starting to happen, the moment her hand touched the book she simply stopped. Momentum carried her forward, toppling down to the ground. In the time between her touching the book and her hitting the ground, her skin turned an icy blue; starting from the hand on the book and rapidly radiating throughout her form. With no reflexes to guide her, the thud that resounded as she hit the floor was tremendous. Her armor sheared right from her form, broken shards of superfrozen metal that spun off and settled a distance away. The snarl that she'd turned toward the Koada'dal was still frozen on her face; not even surprise replacing it due to the rapidity of the action. As things settled into stillness, the book once more started floating toward the koada'dal. The priestess had paused to watch as Sivenka reached through the books. It was hard for her to keep herself from glancing askance at the collection. Even though she was here with a purpose, the feeling of being in the presence of artifacts - useless or otherwise was laden with nostalgia. Thankfully she could still stare at some while Sivenka started to reach through the shelf. Books and maps had been some of the things she had spent more time studying. When the shelf began to shake though, she blinked and her hand immediately fell back to the pommel of her hammer. Though it was Sivenka's snapping cry that woke her senses. "Trickery!" With the words ringing in her ears, she realized the halasian thought it was her doing. She had started to yell back in protest yet her outburst never left her throat as it was strangled by the shock of the scene playing out in front of her. It was luck that she managed to be missed by the larger shards of icy metal as they sprang from the woman. Though she knew at least one had made a hole in the edge of her robes. Her blue eyes darted from the floating book and Sivenka in rapid succession before she unhooked her gavel from her hip, and stepped back from the book slowly. She wanted to tend to the halasian on the floor - she needed to. Even if she had not intended for the guards woman to get hurt, it still happened because of her and she had given her the benefit of the doubt she hardly deserved. With a quick thought she reached into the satchel at her waist, her fingers touching the soft velvet shroud inside and removing the cloth from her bag. With the book closing in, she attempted to toss it over the tome as if netting a wild animal. As soon as the velvet was air born though, she readied her golden gavel into an overhand position to smack the aggressive grimoire to the ground as if it were a rabid animal. The book floated closer and she held her stance until the velvet covered book was within range and then swung, with all the power she could throw behind it. The book made not a sound of protest as it was clobbered over the binding with the priestess's hammer. Momentum slammed it to the floor, where it lay still. Only for a moment, however. It began shaking again and lifting toward Verethne in a stubborn beeline. It would hover closer, but rather than attack or move in for a touch, it would simply remain a few inches from her. In as much as inanimate objects could, it was offering itself to her. The woman on the floor remained frozen solid. A slow creaking sound heralded her first breath as her chest expanded. Her icy eyeballs shrieked in protest as they slid against her frozen eyelids. Through a great effort she managed to turn her glare to the woman, but even blinking was beyond her. Confounded by the book, Verethne tentatively put her hammer back on her hip and tried another approach. With one hand she opened her leather satchel and set it on the floor in front of her before she reached out with both hands to grab the book, ensuring the velvet cloth was still between her and the book itself. Even in her confusion she had the good sense to grip it tightly and stuff it in the bag, closing the satchel and latching it before she moved to kneel beside Sivenka, her mind intensely aware that they had precious little time to spare in this place. She could look around more, maybe spare a few more glances at that strange garden but it wouldn't be enough, she had what she came for and the innocent woman before her was more important in her mind still. With a deep sigh she reached out to touch her on her bare, chilled shoulder cautiously. "I'll fix this.." She whispered, more to herself than the frozen halasian before her. Her mind struggled over her options. She could try to heal her here, or she could take her with her. Either way, she was bound to have an angry, dangerous halasian if she succeeded in anything. But if she left her here, she could give a recount of what happened to any local authority. She wasn't ready to be wanted just yet. Still, she had to try something to ease the woman's pain and began murmuring a prayer to try and dispel the magic the book had cursed Sivenka with. The Halasian woman seemed well-aware of the circumstances, having watched the interaction with the book. She could not, however, express any form of emotion. Even feeling the emotion was tough, as every single bit of her ached. It was a far deeper ache than she'd ever known, worse even than battles on the ship that'd left her in the medical bay for days. Verethne would feel her initial actions provoke some response; a softening and slight warming of the skin under her hand. Something, however, would feel entirely wrong about the situation. Not only should the woman have died from the shock to her organs, she certainly should not be able to breathe. And yet she was, slowly, creakingly. Her breath came out in little puffs of ice crystals; her once vivid sapphire eyes now the palest shade of blue. The woman continued to warm, but just enough that she was pliant. Her first word was little more than a groan, accompanied by another puff of frost. "I'll..kill..you.." She managed to creak, but the words lacked any sort of strength or even emotion to them. She was as weak as a babe, barely able to lift herself to a sitting position. "If you can, I'll let you try." She murmured down to the woman as her hands moved across the woman's back, rubbing gently to try and warm her. Though the time nagged in the back of her mind, reminding her of how much one can be bound to it. "We don't have a lot of time. I have a portal stone and I am going to use it because I don't know what will happen to you if I leave you." Her whispers were quick and punctuated the dead air with urgency. The woman probably hoped Verethne's time was running out and she still struggled with the idea of leaving her here. No. She owed it to the woman to make sure she lived through this. Even if it meant she was going to try to kill her. Honor was fucked up and she hated for a moment that she was not able to part herself from the notion of doing the right thing. She mentally compared herself to other artifact thieves, grave robbers and vault raiders and knew none of them would try to save this woman. Whether she knew it or not though, Sivenka McClare had saved her life and Verethne was well aware of the debt now owed and even through the haze of the adrenaline she knew there was no other option. At least not for her. Taking a deep breath to steel herself, she reached into her pocket and removed the portal stone. It was set to one of her family's deeper, faydark vineyards. She had not visited it since the massacre and knew it was likely to be empty and overgrown. The murky amber stone itself was faded with age and she wasn't even sure it would work or had an ounce of magic left in it, but she had to try. With one last glance down to the frost-touched woman on the floor she uttered the incantation and pressed her free hand to the woman's bare back, hoping it held enough power to take them both away to the dark, wooded vineyard she remembered. A stomach-lurching tug accompanied Verethne's attempt at teleportation, as the room seemed to somehow grow more tight, the air itself tensing and pulling inward. The moment of release would be palpable as it all whooshed away and the priestess felt her surroundings begin to change. A quick glance down to the large guardsicle would show that she, too, was being pulled through. The portal stone did indeed send the priestess to the vineyard, but it was utterly changed from the last time she had visited. Either the massacre had spread this far, or some other random group of ne'er-do-wells had come in and ransacked. Over half of the vineyard was utterly destroyed; the plants long uprooted and decayed, the trellises in that area all pulled out of the ground and tossed haphazardly about. A handful of skeletons betrayed the fate of the overseers and workers. Despite the rampant demolition efforts, a small corner of the vineyard remained completely untouched; this included both the small house in which the overseer would have lived, and the small shrine to the Tunare that Yisteara Morningfall, nee Seinora, had installed upon an earlier visit. A closer inspection would show that the untouched area circled the shrine in a perfect radius with it as the focus. Given the overgrowth of the remaining plants, many of which were at their most verdant as they laced over the shrine, and the darkness of the house; nobody had been here since the decimation of the Seinora bloodline. On the ground at Verethne's feet, the guardsicle creaked out another growl as she tried to move. With a visible strain of effort, the woman pushed one fist into the ground as she attempted to slide herself up into a sitting position. Slowly, accompanied by a sound similar to the low groans of the deep ice cracking in Everfrost that emanated from her very body, Sivenka got her knees under her. Her skin remained a deep, icy blue; with long icicles hanging from her chin, chest, and ears. Either she was unaware of their new surroundings, or, more likely, did not give one whip. Her berserker rage may have been hampered by the fact that her entire body was a solid statue of ice, but it was still quite present. "I could leave you here and run. By the time you defrost I would be gone." She turned her eyes from her surroundings, drawing in a pained breath as she took in the devastation and then veiling any hint of her pain as she looked down at the woman, with displeasure. "You think I tricked you and I understand why you would. However I had no idea the book would do that. I had planned to enter the collection alone and I was not even sure what I was looking for. So you can relax and let me try to help you. Or you can not relax and try to kill me later. I cannot make you believe me but that is the truth of it." The priestess sighed again and looked toward the altar, a tribute to a goddess she did not follow but nevertheless it had survived the massacre. She considered whether or not it would be of use to her and shrugged to herself. Carrying her was not an option and she was barely able to move, not to mention the fact that her moving might in turn result in violence upon her person. She was not the kind of woman to take unnecessary chances and wanted to help the woman before her murderous rage was something she could act on. Mentally, she could almost hear the sands of time rustling as she deliberated. "If I touch you, you seem to warm. You're not going to like it, but I think I probably should do more of that. Or get you into some warm water. But until you can at least walk slowly, that isn't a plausible option." With a resigned sigh she stepped to the side and set her bag down out of reach before removing her cloak and tearing off her robe. She wore simple leather trousers and a tunic underneath, for warmth and protection. Still the added layer was a bit much in the warmer climes of Faydark and could be of use to warm her reluctant companion. She tore the front of the robe down and then walked up behind the kneeling woman, studying her situation carefully before trying to drape the robe over the back of her and the cloak over the front. Her mind quickly tried to think of other ideas but without a basic understanding of what the book did, she could only take shots in the dark and hope to the gods that her hunch was right. Without hesitation she knelt down behind the large barbarian woman and wrapped her arms around her, murmuring another soft prayer to whatever god might be listening - Tunare seemed apt, given proximity. She was not a naturally huggy person, nor was this something she believed was safe, or wise. She was certain in fact, that she was making a terrible mistake as she gave the ice touched halasian a tight hug, enduring the chill that caused a violent shiver to run down her spine. Venka listened to the woman with as much of a glare as she could manage. At the mention of being left alone, she finally gave a slow look to her surroundings. As her brow furrowed, the tiny icicles hanging from it broke and dropped down into the dirt beneath her. The woman could have left her behind in the gallery. She could have fled without her. And yet, here she was, attempting to help her despite the fact that the guard was determined to kill her at the first moment she could actually move. That knowledge slowly sunk into her, calming some of the rage that had started to build at the first moment the book started to float to the priestess. Unable to do much else, she continued to kneel as she listened to the woman think out loud. Despite hearing the thought process, she was still stunned as she saw Verethne peel down her robe. The stun turned into something far deeper and more profound as she felt arms wrap about her from behind, and the seeping warmth of a body pressed into her. What in all of Norrath?! Her horror came out in a surprised creak, strangled by the inability to draw in much more of a breath. Despite the slow spread of heat through her back, nothing about the deep ache at the center of her changed. The dirt around them slowly turned to mud as more and more of the frost coating her skin melted and dripped down. Sivenka was quite a touch-oriented person - with her family and lovers. A stranger who had just robbed her employer? Not really the sort she wished to hug, let alone cuddle with for an extended time. This was akin to torture. Still, Verethne would be able to tell that it was working, albeit slowly. The woman in the priestess' arms was slowly warming, but any magical probes with her healing talents would show that something was still dreadfully wrong at the center of the guard's being, as though something vital had been replaced by an ice-formed doppelganger. Sivenka closed her eyes and prayed quietly to her own deity that this would pass quickly, that whatever the woman could do would help her. Finally, she tried to distract herself from the moment. Her voice came out a little more full this time as she spoke.